Are you new to fishing kayaks or are an enthusiast looking to find yourself the best standing fishing kayak? If you are either, you have come to the right place. In this article, I will carry out a comprehensive review of some of the best stand up kayaks for fishing on the market. Additionally, I have included a detailed buyer’s guide to help you make a wise purchase decision. Why a Stand Up Fishing Kayak? When most people think of yak anglers they think of a big guy sitting in a small kayak drinking a beer with his sun hat and fishing vest on. Truth is often times you have to do a lot more than that. Stand Up Fishing is a great way to spot fish in the shallows or near the surface better. It is also the preferred technique for fly fishing. Fly fishing requires more activity and is made easier when standing. As a result you need a stable kayak to stand on without having to counter balance your weight for each cast that you take. If you are an enthusiastic angler who loves using kayaks when in the water, then you know about the different types of fishing kayaks that you can find in the market. Among the different types of kayaks are sit-on-top kayaks that are ideal for fishing because they are easy to get in and out of in any situation. Additionally, when water gets inside a sit-on-top kayak, it will get out easily and prevent the kayak from flooding. One of the most notable things about these kayaks is that they provide you with multiple sitting options to optimize your comfort when fishing. What’s more, you get to sit higher so that you can have a better view of your fishing waters. The kayaks are also spacious enough to allow you to stand in them. Besides having plenty of storage options, sit-on-top kayaks also allow you to customize them and add accessories. The other types of fishing kayaks that you are likely to find on the market are sit-in kayaks. Sit-in kayaks are more affordable as compared to sit-on-top kayaks, implying that they are a viable option if you are looking for a fishing kayak. These types of kayaks, however, are designed to only allow you to sit inside them, which minimizes your point of view. They also don’t have any self-bailing capabilities, thus making them susceptible to flooding when water gets in. Other types of fishing kayaks that I found on the market include pedal-drive kayaks. Anglers seem to desire this type of fishing kayaks because of their ease of operation. With them, you only need to use your legs to pedal and push them forward. The kayaks are moved either by propellers or by fins situated on the underside of the vessel. Anglers prefer using this type of kayaks because they allow them to cover more distance on the water in addition to being quite comfortable. Moreover, you can reverse these types of kayaks. These kayaks, however, are heavier as compared to the other types and they fall on the higher price range. Why Did the Popularity of Kayaks Grow in the Fishing Industry? If it is your first time to buy a fishing kayak, the thrill involved might drive you into settling for a sub-standard kayak. To avoid spending money on a kayak that is bound to disappoint, you need to know how to review the appropriateness of the vessel. For instance, you must understand that you will find many options on the market. Moreover, you need to know that different manufacturers design and produce vessels differently. As a result, you have to make wise considerations to ensure that you get a kayak that’s best suited to your fishing needs. Where do you intend to fish? Before you make your purchase decision, one of the core things that you should ask yourself is where you intend to go fishing. This question allows you to evaluate the type of kayak that suits your environment. Many people looking to make a first kayak purchase, however, might find it hard to match their needs with a kayak’s features. This is because one has to consider the different types of waters and choose a kayak based on the waters he or she intends to explore. For instance, rivers move fast while some waters have rapids. In such an instance, you may need a kayak that is less than 12 feet because it is more maneuverable. If you intend to go fishing on slow and calm waters such as ponds, lakes, or inshore, I recommend settling for a kayak that measures between 12 and 16 feet to allow easy movement on the waters. If it is in the ocean, you should get a skinny and long kayak – at least 16 feet long. It makes it easy and comfortable for you to paddle. Identify your waters, then settle for a kayak. Different kayaks are designed to suit different kinds of anglers. A novice would not have a comfortable time paddling a fishing kayak that is meant for a professional. If you are new at handling a fishing kayak, you may want to get a wider kayak so that you can have an easier time handling it. As you gain experience, you can pick a narrower and more nimble fishing kayak. Another vital detail that you must look out for is the storage capacity of the kayak that you wish to get. Why is this important? This is because you need to have adequate room for all your necessities. In most cases, different types of boats come with different storage units. Some kayaks have an integrated storage while other models have external storage such as coolers or milk crates. In most cases, sit-in kayaks have an open space to allow you to store your gear while sit-on-top models feature internal hatches. To determine the right capacity, it is imperative for you to consider what you want to carry on your fishing escapades. It will help you get a kayak with adequate storage for your necessities. How Would you like to Propel your Kayak? Fishing kayaks can be moved using different methods. They can be propelled using a paddle, a pedal, a sail, or a motor. It is up to you to select the option that you are most comfortable with. You must also consider your fishing needs before you decide on the drive option of the kayak that you want to get. A keel is a piece of plastic on kayaks that is shaped like a fin. It is attached to a kayak’s hull and gets in the water to improve speed and tracking. I observed that some kayaks come with integrated keels while others have retractable ones. Some kayaks might even come without a keel. I recommend settling for a kayak with no keel if you intend to fish on shallow or rocky waters. If you are going deep water fishing or trolling, however, you might want to consider a kayak that has a keel. Other key factors that you must keep in mind before getting yourself a fishing kayak are its portability and storage. Today, wide kayaks feature a heavy design, and this could make your fishing endeavors a little hectic. If you go kayak fishing frequently, then you have to conduct adequate market research to find a kayak that has a lightweight design to allow you to move easily. You might consider getting a kayak fishing trailer to allow you to transport it easily using your car. If you have to lift the kayak to the top of your vehicle or truck every time you go fishing, make sure to get a lightweight item. Keep in mind that sit-on-top models tend to be heavier than sit-in models. Before making a purchase, you have to set your priorities. Even if you’re stoked about buying one of the new fishing kayak models, it is imperative that you set budget limits. You have to get out in the market, review the different types of kayaks available, and consider their features and prices before settling on any. Pick the kayak with high quality features and within your budget. Here are some of the benefits that you should expect from fishing kayaks. If you have ever owned a boat before and a fishing kayak, you can attest to the fact that kayaks are cheaper to operate as compared to boats. This is because kayaks do not require a heavy initial investment and most do not have any fuel costs. Additionally, they have little or no maintenance cost and you do not need any licensing because they are foot or pedal powered. As long as you are in an area where there is a shoreline, you can easily launch your kayak and go fishing. What’s more, an angler can rely on a kayak to go fishing on shallow or rocky waters. A kayak also lets you fish in backwaters and streams, which are areas with little fishing pressure. Another major advantage of kayaks is that they are quiet. The stealth of the kayaks allows you to sneak up on fish, allowing you to catch more fish. The ultimate goal for going fishing is going back home with a catch. After all, that’s what defines your prowess as an angler. Unlike boat anglers who tend to move from one point to another when they fail to make a catch, kayak anglers tend to stay at one point. They also end up making a huge catch even in areas where boat anglers fail to make even a single catch. Another interesting detail about these standing fishing kayaks is that you can customize them to suit your specific fishing needs. You can find kayaks that come with an entire kit while others also come as boned units. You can also get things that help stabilize the vessel such as a kayak stand up bar. Fishing Kayaks are designed to allow you to make adjustments so that you can add accessories and storage units. This helps to optimize your fishing experience every time you go fishing. Without further ado, here are some of the kayaks you can stand up in that you could consider if looking to acquire a reliable fishing kayak. Fishing is interesting when you have the right equipment with you. If you want to make each fishing trip interesting, you could start out with Feel Free Lure 10 Kayak. I think this is a kayak worth mentioning because of how you can maneuver with it ease across the waters to make a great catch. The kayak features an impressive camo design that allows you to maneuver inland waters without getting detected. It also has an ergonomic design to ensure that you have an easier time fishing and carrying it. You hardly have to worry about its portability because it comes fitted with a wheel in the keel to allow easier transportation. Moreover, it has an integrated bow, stern, and side carry handles. It only weighs 69 pounds, which is not too heavy a weight to carry. Without a doubt, this kayak will take your fishing expeditions to the next level. It has been designed to deliver you with versatility, comfort, and stability all in one package. I would recommend getting Feel Free Lure 10 Kayak if you enjoy fishing in rivers and lakes because this is where it performs best. I was particularly impressed by its unique features, especially the removable, multi-position, multi-level wide gravity seat. The gravity seat allows you to adjust its height using a lever. It also includes a Uni-Track system that allows you to add accessories to your kayak without having to drill any holes. The kayak also comes with a handy flip up console for lures that measures 13.5 inches long, 6.5 inches wide at the widest point, and 5.5 inches deep. It also comes with a very stable 36-inch wide hull that comes paired with a padded standing kayak platform. This feature allows you to paddle or cast when you are sitting or standing regardless of the fishing grounds. No waters are too tough for this kayak. Additionally, Feel Free Lure 10 Kayak comes with two fishing rod holders and a track system to provide you with a wide array of outfitting positions. Hobie Mirage Outback Kayak is one of the standing kayaks that I thought could be best suited for your fishing hobby. The kayak is propelled through pedals, which makes it easier for you to move further distances in the water. Its design allows you to operate it hands-free, which means that you will have the energy to fish over a wide area. Overall, this kayak has an excellent design although I wasn’t impressed by its hull shape and design which is designed to have little drag while peddling. 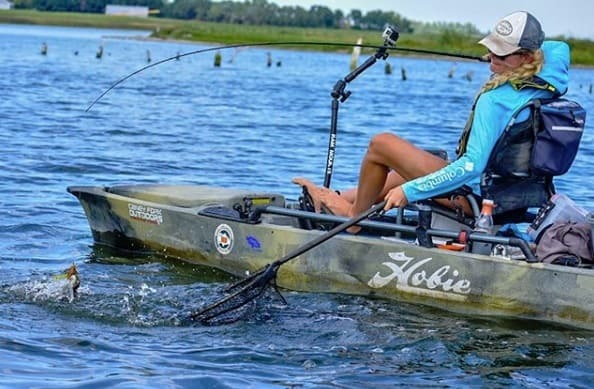 If you would like to acquire Hobie Mirage Outback Kayak, you have to prepare yourself to dig deep into your pockets because this wide fishing kayak falls in the higher price range. The kayak weighs about 91 pounds, implying that it might need more than one person to get it from the car to the waters. Interestingly, Hobie Mirage has a great width that enhances its stability on the water. As such, both beginner and professional anglers can operate it with ease. This sit-on-top kayak also features a vantage CT seat to maximize your comfort as you fish. Additionally, it has adequate space to provide you with a standing area and storage.I consider it the most stable fishing kayak due to its width. Moreover, it comes with accessories such as a cup holder, mesh-covered storage pockets, utility trays, rudder controls, and rod holders among others to maximize your fishing experience. It also has a Twist and Stow rudder system that helps you to steer the kayak when it is windy. You can control the rudder with your left hand and fish with the other. In front of the seat is an 8-inch round hatch designed in a way that ensures you won’t trip. Wilderness Systems Tarpon 100 Angler Kayak is another kayak that I thought was worth reviewing. This is because I found it to be one of the most affordable fishing kayaks that you could find on the market today and one of the best fishing kayaks for the money. So, what makes the Tarpon 100 worth mentioning? To begin with, the kayak is suitable to anglers that have an extensive experience of fishing using kayaks. The kayak allows you to operate it at a relatively high speed while maintaining exceptional stability on the water. Another aspect that caught my attention on this kayak is its comfort. When you go fishing only for you to stay in the water for hours, a comfortable seat is crucial. Fortunately, this kayak comes with a contoured seat cushion and a backrest with padding for optimal comfort. You hardly get tired when fishing with this kayak and that’s not all. The kayak also comes fitted with adjustable keepers foot braces so that it can be used by different anglers. The kayak weighs 55 pounds, which makes it easy to load and off-load from your car to the water. When it comes to the storage of the kayak, you have nothing to worry about. This is because the kayak includes Orbix dry storage hatches in the bow and towards its center. Moreover, it has a tank situated in its stern that you could use to carry your live bait or place your cooler. Did I mention the outstanding stability of this kayak? Well, Wilderness Systems Tarpon 100 Angler Kayak is 10 feet in length and 30.5 inches wide. This works to enhance its stability for easier maneuverability. As such, you could easily use it to fish in calm and small waters such as in lakes and ponds. The last one on my list is Old Town Predator 13 Kayak. If you have been looking for a fishing kayak but could not settle on the specific one to get, you might want to try out this kayak. The kayak is a suitable option for anglers who are looking to get a vessel that falls in the mid-price range. Moreover, it can accommodate a weight capacity of between 400 and 425 pounds. The kayak’s hull material is LT900 polyethylene, and it features a camo design. Its length is 13 feet 2 and inches while its width is 33.5 inches. Its hull has a round-like design, which is not too bad for such a kayak. When it comes to the comfort of this kayak, I couldn’t complain one bit. The kayak’s design incorporates a firm seat frame that is more comfortable as compared to similar seats that you will find in other kayaks. When it comes to advancements, this kayak comes with a center console that gives you a platform to place your fish finder. What’s more, it includes a scupper hole that allows you to install your fish finder without making any customization’s. This kayak can also hold a significant amount of load because it comes with a large bow hatch at the front to offer adequate storage space. Interestingly, the bow hatch is lockable to keep your items dry and safe. The kayak also comes with a molded paddle rest but it does not include a rod holder. Instead, Old Town Predator 13 Kayak comes with six removable mounting plates. They allow you to customize the kayak easily. The kayak also features a three-stage Element seating that allows you to adjust the seat. If you have been looking for a kayak to go on your fishing escapades, then you might want to check this one out. The first thing that caught my eye is the appearance of the kayak. It features an excellent design and is made of high-quality materials. Eddy Gear has designed it with rotomolded single piece polyethylene to enhance its durability. The kayak also comes in two color options so that you can select the one that impresses you most. This kayak is 13 feet 4 inches long and 31.5 inches wide. This size ensures that you have a stable fishing kayak as you wade through the waters. I was impressed by the fact that the kayak has a weight capacity of 670 pounds but only weighs 69 pounds. Although you might experience slight difficulty carrying it by yourself, the weight is manageable. Worse case you can always get a kayak cart should you be fishing by yourself. Intriguingly, this kayak is priced reasonably, considering its quality and strength. The kayak also comes with scupper holes that prevent it from flooding when water gets in. I was also impressed by the stability of this kayak. Even as a novice, you won’t have to worry about it tipping over when you’re about to make a big catch. What’s more, it comes fitted with a myriad of organizational features, and it has a circular hatch in front of the seat to allow you to store your necessities including phones, car keys, or any other valuable item that you wouldn’t want to lose. This kayak combines a balance of speed, performance, maneuverability, and stability to provide you with the ultimate experience while out there in the waters. Eddy Gear has also designed this kayak to suit the needs of all levels of anglers. As a result, it can perform well in most waters although it performs best in rough seas. Getting yourself the best stand up kayak is not a walk in the park, especially if you are new at it. This is mainly because you will find many kayaks in the market with different manufacturers trying to make a kayak that is unique and better as compared to that of the competition. 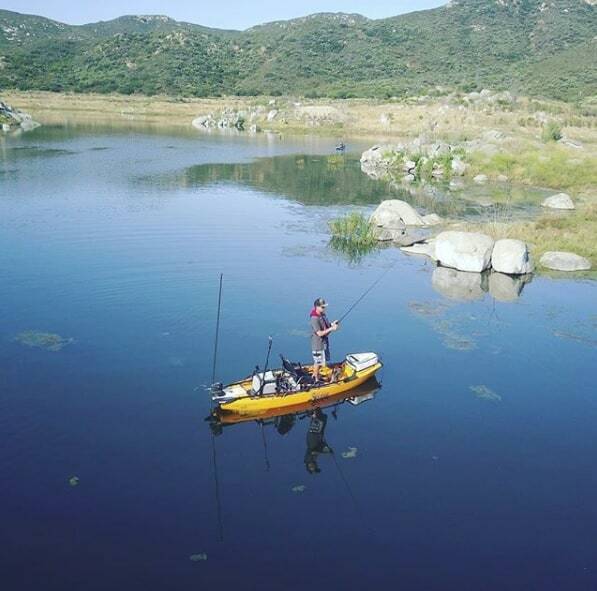 That is why I took the liberty of conducting research to help you find several of the most stable fishing kayaks that could suit your fishing needs. While each of the kayaks above will serve your needs well, I consider Feel Free Lure 10 Kayak to be the ultimate winner of this review. This is because it is available at a friendly price, and it is quite comfortable – you could spend hours in the water with it. Moreover, it has some of the most unique features you’d find in a fishing kayak. For instance, the gravity seat allows you to control your sitting position, thus enhancing your comfort. Doing a lot of fishing kayak research lately. Thanks for this nice article!